The latest and most advanced device using ultrasound technology for lifting and contouring is now available in Australia through distributors Cryomed Aesthetics. Called the ULTRAFORMER, it works through non-invasive targeting of different layers of the skin through micro-focused high-intensity ultrasound waves that penetrate without damaging the epidermis. This focused energy reaches the SMAS, the layer involved in surgical face-lifting, and causes immediate contraction and triggers cell renewal which results in a more natural tightening and smoothing effect for both the face and the body. 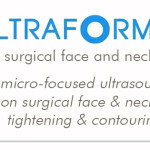 The ULTRAFORMER uses precise, micro-focused ultrasound waves that focus on specifically targeting soft tissue layers in order to assist in growing new collagen providing you with a more toned, tighter and smoother appearance without the invasiveness or downtime that other treatments have. Using a unique elliptical transducer to deliver higher peak power with the market’s only dual-hand piece system, the Ultraformer allows you to enjoy quicker treatments with almost zero downtime. The ULTRAFORMER has an advanced design slim cartridge, allowing for more control and precision when targeting problem areas. It also has higher power than other devices on the market allowing for less treatment sessions while maintaining discomfort at a minimum. The energy emits heat to the target area between 65 and 75 degrees Celsius, which causes rejuvenation zones at 1.5mm, 3.0mm and 4.5mm depths while protecting the top-most epidermis layer. There can be a noticeable lift after only the first treatment and results can be seen improving up to six months thereafter, improving with each consecutive treatment. A practical, more affordable approach for those not wanting to undergo surgery, the Ultraformer treatments can be completed in as little as 20 – 30 minutes. Completely non-invasive, it allows patients to go about their daily activity immediately after a treatment. A. Very rarely. Depending on the energy levels, the patient and their skin type you may possibly experience slight swelling and redness but this will disappear quite quickly. Q. Is the ULTRAFORMER safe? A. 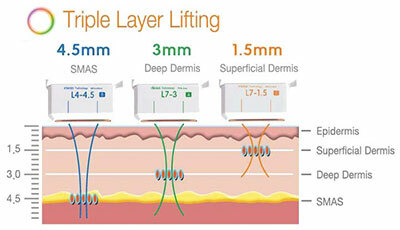 Yes, the Ultraformer delivers highly predictable results. Ultrasound technology has been used for decades, and the Ultraformer has been specifically designed to minimise risk of adverse effects during and after treatment. Q. Does the ULTRAFORMER treatment hurt? A. Depending on your pain tolerance, you may need topical anaesthetic prior to treatment. With the advanced technology in the Ultraformer, discomfort is significantly reduced when compared to older, comparable devices. A. Results typically last between 12 – 18 months, with a majority of patients getting repeat treatments at 6 and 12 months. I am a mother of 4 wonderful children and as you know that comes with some body modifications you might not have been expecting,lol. I was wondering if the ultraformer was able to be used on breasts? I like the size, and am not looking to get implants, just want them firmed up. Thank you so much for your time.